The following is a guest post by Keith Humphreys, a Professor of Psychiatry at Stanford University and Former White House Policy Advisor. Increasing government spending improves educational outcomes and doesn’t enhance them at all. Augmenting incarceration rates reduces crime and increases it. Raising the minimum wage will increase unemployment and not affect it in the slightest. These statements are neither Zen koans nor political doublespeak, but summaries of policy research findings that are not as contradictory as they at first may sound. All of them stem from a reality that is frequently forgotten in political discourse: In many public policy areas there exists a “sweet spot” in which pursuing a certain approach does maximal good, and beyond which further increments make less difference, no difference, or even make things worse. Daily life is full of consistent rules which mathematicians call “monotonic” relationships. Pedaling your bike harder always makes you go faster rather than slower. Putting more of your paycheck into savings bonds always increases the interest you earn rather than decreasing it. Turning the heat up on the stove always makes water boil in less rather than more time. Yet sometimes life’s rules are not so simple. Consider for example your body temperature. Imagine that after a long sleet-drenched walk on a windy, bitterly cold day, you enter your house with your knees quaking and your teeth chattering uncontrollably because your body temperature is at a near hypothermic 96 degrees. A cheery fire, a cup of hot cocoa and your favorite blanket raise your temperature by three degrees, leaving you feeling good as new. But by that evening, a virus you caught that day works its evil magic and raises your temperature a further 3 degrees, leaving you feverish, weak and miserable. If asked to describe the effect of raising body temperature, you could give no simple answer. You would know from your own experience that it can be lifesaving or immiserating, depending on whether the change moves you towards or away from 98.6 degrees, the sweet spot for human body temperature. Sweet spots abound in public policy. Consider the evergreen debate between those who believe that we should spend more on education to help children learn and those who believe such spending increases are wasteful and unnecessary. 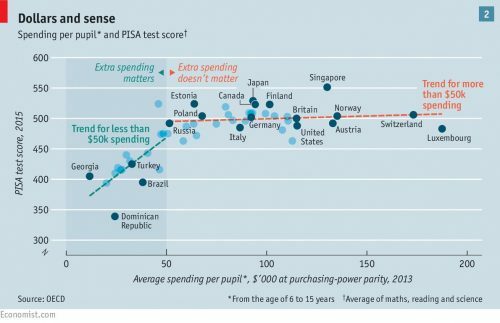 The Economist summarized international data on per pupil spending from age 6 to 15 and its relationship to performance on the “PISA” test, which assesses student performance in math, science and so on. If one compared a country spending less than $50,000 per child (e.g., Turkey) to a country spending about $50,000 (e.g., Russia) the case seems strong that more spending improves educational outcomes. But after that point the relationship nearly disappears such that countries like the United States and Luxembourg that spend many times what Russia spends don’t have better outcomes. Forecasting the influence of increased educational spending in absolute terms, as is common in political debates, is thus a fool’s errand. The nuanced reality is that if you were running a national budget dedicated to improving the lives of children and were below the sweet spot, hiking educational spending would probably help children learn more. But above the sweet spot, you might help children more by spending on something else on which you were below the relevant sweet spot, such as removing lead from homes, building safer playgrounds, or expanding parenting effectiveness training programs. Health economists have described this phenomenon in terms of the healthcare production function: At some point further financial investment and evidence application in health care no longer generates as many positive outcomes (e.g., increased quality-adjusted life years) as would a comparable investment elsewhere. Sweet spots are also a widely ignored reality in ongoing, bitter debates about crime, policing and incarceration. In the 1980s, increasing the likelihood of incarceration for criminal offenses contributed to the drop in the crime rate, but as mass incarceration emerged throwing ever more people in prison stopped reducing crime and may have even started to increase it. Similarly, increasing the number of police is grossly underpoliced areas has a profound deterrent effect on crime, but once a certain level is reached hiring more cops no longer affects the crime rate. So if a policymaker wanted to reduce crime, building prisons and hiring police could be a wise investment or a foolhardy one. 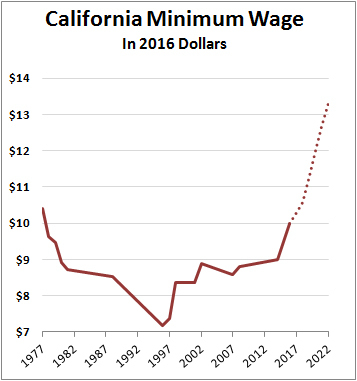 To cite an example from labor policy well-described by Kevin Drum of Mother Jones, California activists who support a $15 minimum wage cite studies finding that increasing the minimum wage does not lead to fewer jobs. But as Drum noted, all these studies have been conducted within the narrow range of changes in the minimum wage that have occurred over time, and a $15 minimum wage is far outside it. There is definitely a point at which higher wages will cause unemployment (otherwise, make them $1,000,000/hour and we can all retire after one day’s work), and there is no guarantee that the sweet spot at which workers lives are improved without job loss isn’t well below $15/hour. For a range of political, tribal and emotional reasons, sweet spots are always going to be underappreciated in political debates, when tend to be dominated by shouting matches between proponents of simplistic positions that do not change in light of current circumstances, e.g., “More money for health care!”, “Lower taxes now!”, “Tough on crime!”, “Mass incarceration has failed!”. But a sophisticated policy maker, journalist, researcher or voter should recognize that there are few absolutes in public policy. Very often the policy change that worked at a different point in the curve will no longer yield a benefit or even be counterproductive of further pursued. Our political life is usually characterized by the search for simple answers, but good governance depends on the search for sweet spots.